Another Miss Finger Lakes Pageant has come to pass, and with it, my crew's annual pilgrimage to Corning. As usual, I was so pleased to traipse up and down the boutique-lined Gaffer District, shopping in antique and fun clothing stores. 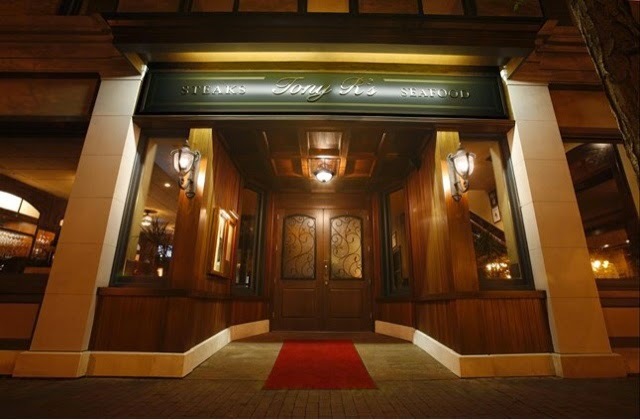 This year, we chose Tony R's Steak and Seafood for dinner, a place I've been wanting to hit up for the last two years or so. As soon as you step into this expansive space that actually takes up three buildings on Market St., you are whisked away from little Corning with marble floors, oodles of dark woodwork and piano music twinkling from a balcony above. The feeling of transportation continues into the dining room, a former bank, adorned with a large fireplace and some mounted big game heads from the owner's safari hunts in his native Africa. It is big, but quiet and dim, encouraging a deep breath and a relaxing sigh as you peruse the varied menu. The feel is very clubby, very masculine, but enveloping. The generous bread basket is filled with homemade, crusty and hearty Italian and brown breads. The texture is more crumbly and tender than a ciabatta, but the robust, browned crust is homey and just slightly smoky. I very much wanted to order both the beef carpaccio and the tuna appetizer, but it's a new year and I'm back on Weight Watchers, so saving points for steak won out. 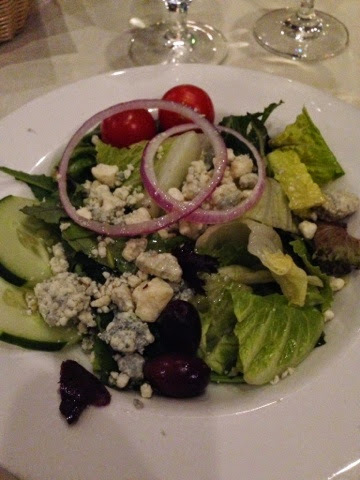 That said, my starter salad with house Italian dressing and crumbly blue cheese was fresh and flavorful, the dressing tart but not too sharp. It was basic, but good basic. I love a couple black olives on my salad, and I received them. Cool. Let's cut right to the meat, shall we? I am firm believer that the ribeye is the highest form of beef perfection (except maybe the short rib, but that's for another post). So I ordered the delmonico, even though 12 ounces of well-marbled choice cow is an insanely large portion and my Weight Watchers coach probably keeled over somewhere when the order escaped my fat mouth. 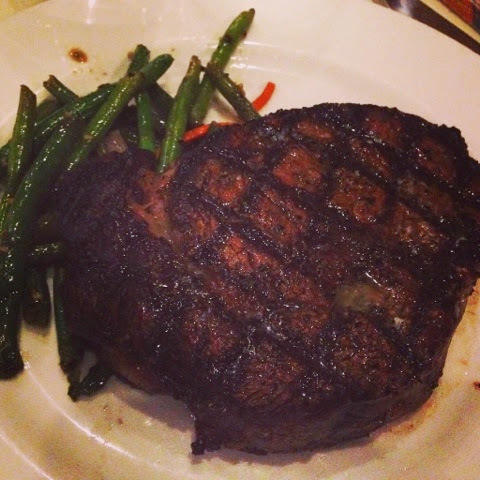 When we received our steaks, our exemplary waitress Marci stuck around and requested that we each take a first bite, so that if one of our grilled slabs of Heaven happened to be cooked in a manner other than our liking, she could fix the problem. I have literally never had this happen, anywhere. Well done, Marci and Tony! And can you see that gorgeous little pool of fat in the meat dimple up there? It looks so delicious, I almost wanted to lap it up rather than cut into it. But I relented, and I bit. Holy cow (literally)! There are adjectives like tender, savory, well-seasoned and juicy that I would ordinarily use to describe such a protein. None of them are good enough to describe this steak. Did I really taste this wonder in Corning? The explosion of umami every bite delivered was exceptional. This seems crazy to say, but this might have been the best steak I've ever tasted. 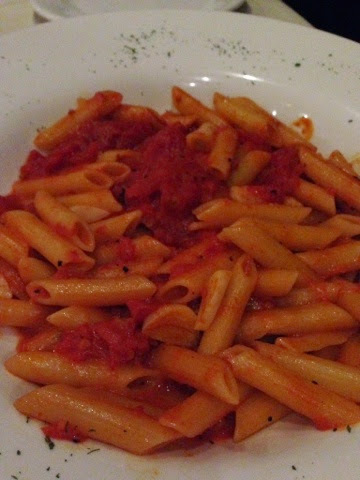 Maurina's penne alla vodka was the lightest, brightest version of this dish I've discovered. I don't even think there was cream in it, you guys. So, it was very different than what I was expecting, but garlicky and fresh tasting. Quite delicious. 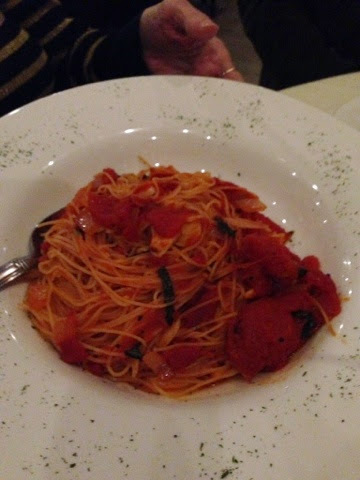 Pasta pomadoro was like a taste of summer on a cold winter's evening - totally herbaceous with a burst of fresh basil, garlic, and crushed tomato. The delicate angel hair pasta was a perfect pairing with this whisper light sauce. Chicken campagnola was sneakily quite spicy, a fact not revealed on the menu! 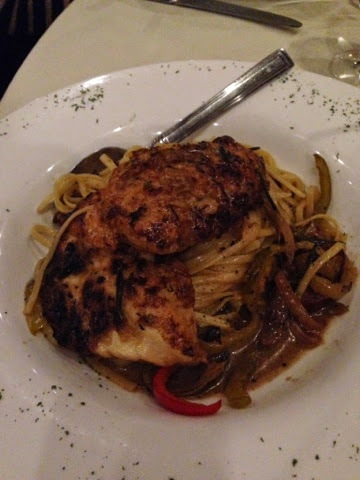 Tender sautéed chicken, al dente linguine, and spicy Italian sausage played with fiery cherry peppers in a light, just slightly creamy wine sauce. I would order this dish on a return trip and chow down on this fantastic, kicky combo. We split a delectable plate of wild mushrooms sautéed in butter with fresh herbs for our steaks to add woodsy, earthy oomph to the works. One diner exclaimed that while he is not a shroom fan, these made him into a fungus 'shipper. Imagine that. He's a pretty fun guy. Please don't kill me for saying that. 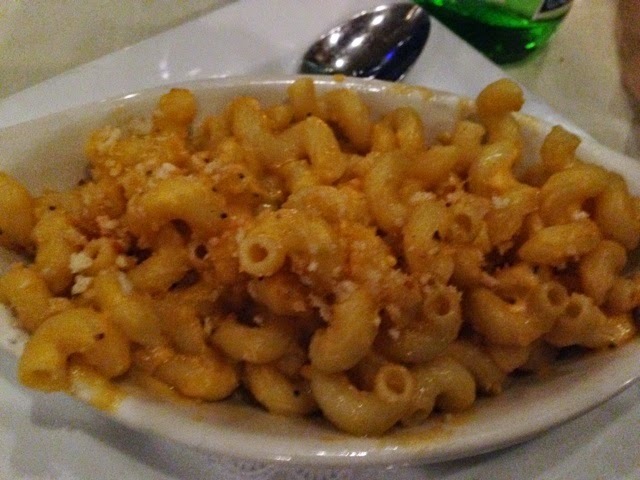 Another side of mac and cheese was a little pedestrian compared to the rest of our terrific food. I know I'm a harsh critic of mac, but this was lacking zing, overt creaminess, or sharp cheese flavor. We agreed it was a little dry, and scooped up some more shrooms. I really wish we'd had time for dessert, because Tony's has baked Alaska. How old school and fun is that? Anyone want to go back with me for appetizers and dessert? I give Tony R's an eight on the BHS scale, and from the response we received at the pageant when we told locals we'd dined there, I think communiy sentiment would agree. This is one club everyone want to join. My personality is big; my hunger is bigger! That steak looks absolutely amazing. No time for dessert are four of the saddest words in the land. It’s great that you finally had the chance to visit this place. It seems like a very fancy restaurant, and the food looks very appetizing. Speaking of which, that steak really looks tender and juicy. I’m sure you guys enjoyed it very much. Anyway, thanks for sharing this with us. Here’s to more steak-outs in the future!